Around the middle of the year when I started riding about 120km/week, I realised that it probably made sense to get an electric assist for the bakfiets. I spoke to the guys at DutchCargoBike.com.au where I bought the bakfiets from about ordering a genuine Azor/bakfiets.nl e-bike kit so that the end result would be the same as if I had bought it electric from the factory. 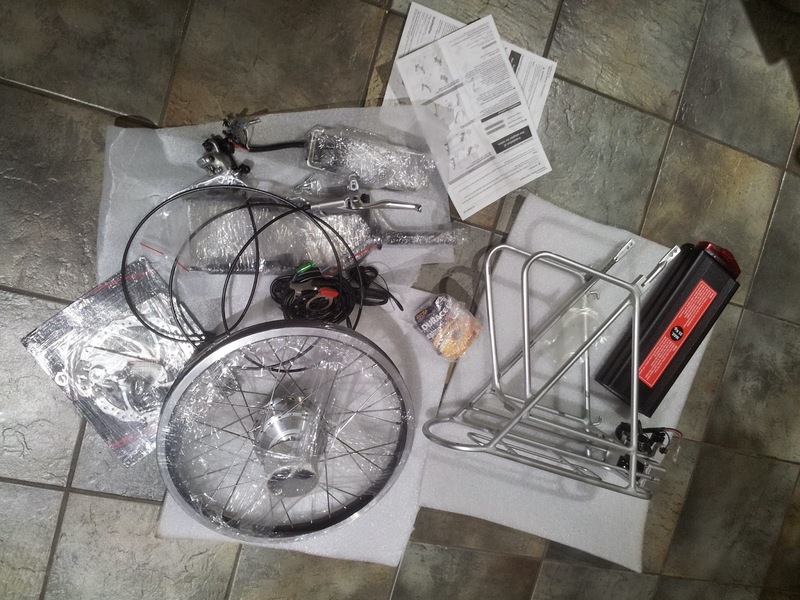 That was back in July, fast forward now to December, and the kit has arrived in the post just in time for the Christmas holidays to get it all installed and working. 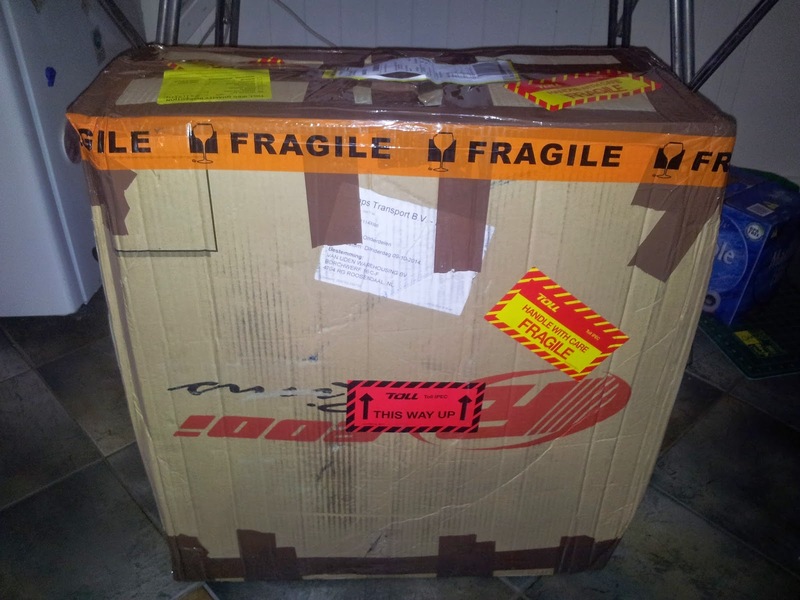 Everything arrived in this nice big box. There was some problems with the courier, which is why the box is looking a bit battered. I wanted a comprehensive kit, and that it is. Not only is the motor there, but it is part of a complete new front wheel. There is also a complete hydraulic front disc-brake (to help stop a speedy fully loaded 1/4 tonne bakfiets combination), new front-fork with the disc-brake fittings, all the little screws and washers and things, the crank-sensors that make this a pedel-elec rather than throttle kit, a new rear pack that looks very solidly built, and into which the battery pack fits. The battery pack itself has the rear-light built in. There is also the electronic controller, and display for the handle bars and all the other bits to fit it together. The only thing that I can't find is the mains power adapter. I do vaguely recall discussing something about it, and that maybe it would be a separate item, but that was a long time ago. I have left a message with Dutch Cargo Bike to remind me what the story is there, or find out if it was left out by mistake. I'll aim to write a series of posts as I go about building it all up over the coming weeks. The next post will likely be about the front-wheel assembly and installation, since I have already made some head-way on that.